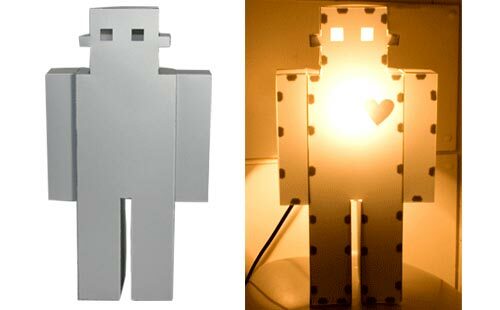 Here’s a fun gadget, which is bound to brighten up your desk, the Robot Lamp. This fun robot lamp stands 50cm tall and is made from lightweight Polypropylene, an ideal addition to your geeky office or apartment. Add a bit of character to the room with the Robot Lamp. Cute and cautiously light he’ll add ambience and ambivalence to the room, the cold exterior of a robot when switched off but amber glow and shimmering warmth when switched on. This fun robot lamp is available for£49.99 about $75 from Lazybone.